I don’t know whether its this amazing weather or the fact that I can never find anything to wear (even though my wardrobe is slowly taking over our whole bedroom) but I’ve found myself spending a long time scrolling through the ‘new in’ sections of some of my favourite sites and basically wanting every little thing! 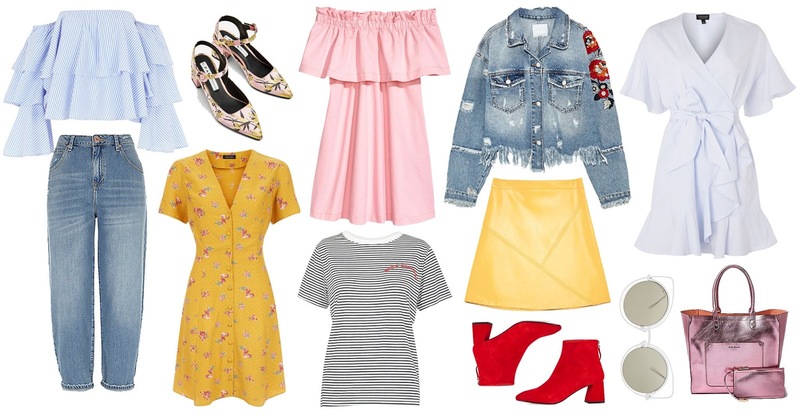 I’m really loving the trends on the high street right now and recently I’ve been adding more colour to my wardrobe, so the bold yellows and reds and the pretty pastel blues and pinks on the rails right now are seriously calling to me! This started out as a small, perfectly formed little wish list but it quickly escalated out of control. I couldn’t decide which pieces were my favourite from my rather large bookmarks list, so I thought, what the hell, I’ll show you them all! Yellow is my absolute favourite colour and I love wearing it, hence why it makes up such a large chunk of the collection above. The same goes for stripes and slogans – I just can’t get enough. Then of course, it wouldn’t be my wish list without a good dose of denim! Something I’m really keen to dabble in this Summer is white denim. I’m loving the ripped white boyfriend jeans which would look SO good with a bright bardot top or a pretty printed cami. I’ve been delving in to the world of coloured shoes recently too, so there’s a few pairs on here that would add to that collection perfectly. I love the idea of embroidered shoes, as I never really got in to the embroidered boots trend at Winter. I felt they looked a bit ~much~ for me, but the paired down sandal and slingback versions are something I can definitely get on board with! I’m absolutely loving everything on this list and just wish it could all magically appear in my wardrobe, especially since its the perfect weather for it all right now!! What are your favourite pieces?